Groups of massively multiplayer online gamers from around the world band together to form...unions. No, wait, stay with me! 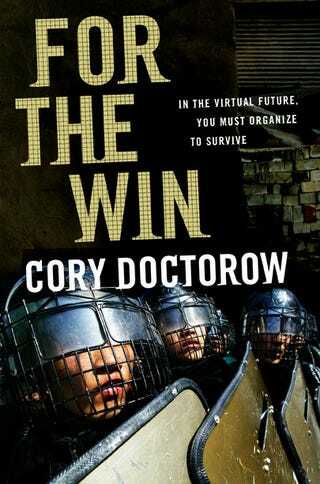 For the Win is the latest book from Cory Doctorow, known for his work at website Boing Boing as well as his best selling novel Little Brother. The book is set in the near future in which gold farmers slave away in virtual worlds that boast economics rivaling real world ones. And the workers in these game worlds are either brutalized or are indentured servants or are both in the real world. The story of these characters intertwine and link though gaming and technology: a China-obsessed Jewish teen from Southern California, kids from Indian slums and Chinese gold farmers, and their paths collide with union leaders, greedy bosses and an underground talk radio celebrity. All of this is against the backdrop of MMOs. But does a book about organizing virtual labor work in reality? Quite the Yarn: Forget Doctorow's outspoken politics, this guy can tell a story. The pacing keeps things moving, and for a book about unions (and virtual unions at that! ), it zips by page after page. What really makes the book work is that so much of the action is externalized in the real world. They don't just battle with keyboards, but with their fists. The stakes are high, and there is so much more to win and lose — it's not just video game lives they are fighting for, but their very own existence! And since they are fighting against such brutal conditions, organizing and striking can cost them not just their livelihoods, but their lives. There are the occasional sidetracks Doctorow takes to explain things like gold farming, virtual economics and even inflation and deflation. While interesting, these were not my favorite parts of the book. I kept wanting to get back to the story and the characters. Nice Prose: Doctorow is at the top of his game here. His descriptions are even more vivid (and humorous) than, say, Little Brother. Reading For the Win is pure pleasure. Real People: The characters are engaging and imperfect. (They're sometimes pig-headed and even arrogant!) Which is not a determent in the least. They are humanized, and they leap off the page. They change, they mature. But beyond character arcs, Doctorow's basic approach to them is refreshing. For so many years, Chinese gold farmers have been portrayed in the West as some sort of faceless gaming blob. For the Win puts a face of them, gives them the humanity that they deserve. Doctorow does a fine job of breathing live into all the protagonists. Writing for Kotaku has shown me first hand (and continues to do so!) just how international gaming is. Regardless of culture or language, people all around the world enjoy many of the same games — which is exactly how For the Win depicts gaming and gamers. Gaming is a nation unto itself and gamers are its citizens. Doctorow has become the John Hughes of tech savvy kids' angst. For a 38-year-old, he still seems hot wired into the thinking and feelings of teens, something that benefits both the book and the character. There, however, is a general good-guys-bad-guys vibe. But those imperfections the protagonists give For the Win a necessary shade of gray. Strong Female Characters: The concept of "gamer girls" seems overplayed and often borders on cliche. For the Win is artfully able to depict smart, young females who game and totally sidestep said cliche by giving them humanity and showing emotional strength — and weakness. They don't just get into virtual fights, but physical ones as well, standing up for themselves and others. Heart On Its Sleeve: Doctorow, as Gizmodo contributor Joel Johnson put it, is "plucky". Doctorow has opinions — some of them are popular. Some are not. Some make sense. Some do not. But he seems to think a great deal about what he believes, his personal code of ethics and isn't shy about voicing it. In short, he has something to say. So even a book about gamers unionizing is far more compelling than one would think. The general premise, exploited gamers organize, seems so absurd if it didn't actually carry so much weight. We live in a world in which tangiable goods are made at ridiculously low costs. Those in the West consume those low cost goods. Certainly, consumption of these goods has built up the robust economies of China and India. Yet, in the factories, there are those who are overworked and taken advantage of. (Just read about the atrocious working conditions at Chinese company KYE Systems Corp, which manufactures control pads for the Xbox 360.) Doctorow goes one step further and applies those working conditions to the virtual money and virtual goods. For the Win has decidedly a pro-union slant, which might turn off some readers, but for me, what made the book work was that these characters were organizing using tech and organizing over gaming. The universe of video games are not tangible in the traditional sense, but even if you cannot reach out and touch them or put MMO gold into your pocket, gaming is very real. The relationships are real. It is worth fighting for. Microsoft Supplier Factory Treats Workers Like "Prisoners"
No, Nintendo Will Never Make MMOs: Okay, never is a long time. A really, really long time. Some much of the gamer stuff in the book works — the way they talk, they way they interact and even descriptions. It all rings true. Doctorow knows what he is talking about — not surprising as his wife is a former Kotaku contributor! Which is why it was all the more heartbreaking to see that there is a Nintendo MMO in the game. Keep in mind that there are other games in the book, and For the Win is not about some made-up Nintendo MMO! But just the concept of a MMO from Nintendo, a company which isn't known to separate its hardware from its software and isn't known for its online prowess, actually took me out of the book as I attempted to rationalize this turn of events. Yes, this is fiction, I know! I can see where he was coming from, however. I think that Doctorow needed a franchise that was well known to everyone, and Mario was perhaps a logical choice. Just don't see a Mario MMO happening...ever. The book's heavy unabashedly pro-union message and didactic nature might leave some readers cold. Sometimes while reading the book, I felt as though perhaps the idea of doing something on Chinese workers unionizing held the most appeal for Doctorow. Of course, this is mere conjuncture on my part. And even if that is the case, it's fascinating that Doctorow was able to deal with that issue via gaming and technology as opposed to doing a straight up story about factory workers. And in the process, hit the nail on the head about so much of online gaming, online interaction and the virtual world. There are a lot of big ideas and big ideals in For the Win. And For the Win largely does that, win. Considering how few game books there are (and how many fewer fiction ones there are), the book is a welcome addition to bookshelves already crowded with Xbox 360, PS3, Wii and PC games. So many people get gaming wrong. They just don't get it. At all. Doctorow does. For the Win was written by Cory Doctorow. Releases in North America on May 11. A review copy was provided by the publisher.